This is a Telugu name; the family name is Bokkala. Bokkala Kishore Kumar (born September 19, 1980), known professionally as Vennela Kishore, is a Tollywood actor. He was given the moniker "Vennela" after his first feature film Vennela. He was awarded the Nandi Award for Best Male Comedian for his performance in Inkosaari . 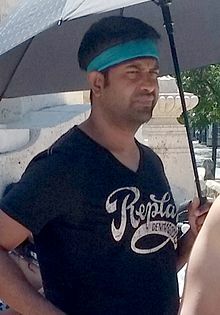 Vennela Kishore, shooting in València. Kishore was born in Kamareddy, Nizamabad, Telangana, India. He attended Jeevadan Convent High School. Before his acting debut, he was working in the U.S. as a software quality engineer. In 2008, he changed career to fulfill his passion for films and moved to India to pursue a career in the Telugu film industry. Kishore received appreciation for his role "Sastri" in the film Dookudu. His other performances include Bindass, Pilla Zamindar, Daruvu, Seema Tapakai, Badshah, Doosukeltha, Pandaga Chesko, Srimanthudu, Bale Bale Magadivoy, Ekkadiki Pothavu Chinnavada, and Ami Thumi. He also directed two Telugu films (Vennela 1½, and Jaffa). After tasting failure with his directorial projects, he has returned to acting. ^ "Vennela Kishore". www.filmcentro.com. 4 November 2013. Archived from the original on 18 July 2017. Retrieved 21 January 2014. ^ "Interview: Comedian 'Vennela Kishore' Interview with Kishore (Khadir of Vennela)". Idlebrain.com. 4 November 2008. Archived from the original on 27 February 2015. Retrieved 19 July 2014. ^ "Interview with Kishore (Khadir of Vennela)". Greatandhra.com. 10 October 2010. Archived from the original on 24 September 2015. Retrieved 19 July 2014. ^ "Mahesh to recreate magic with Sastri & Venkat Rao". ultimatecine.com. 12 April 2011. Archived from the original on 3 February 2014. Retrieved 21 January 2014. ^ "Vennela Kishore turns director!". chitramala.in. 30 June 2011. Archived from the original on 29 July 2014. Retrieved 19 July 2014. ^ "Vennela Kishore to play a father". 16 September 2013. Archived from the original on 13 July 2015. Retrieved 19 July 2014. ^ "MLA movie review: Kajal Aggarwal-Kalyan Ram starrer is forgettable". indianexpress.com. 23 March 2018. Archived from the original on 30 March 2018. Retrieved 11 April 2018.